A one-off session is a great way for you to get an idea how I can help you before committing to a package. 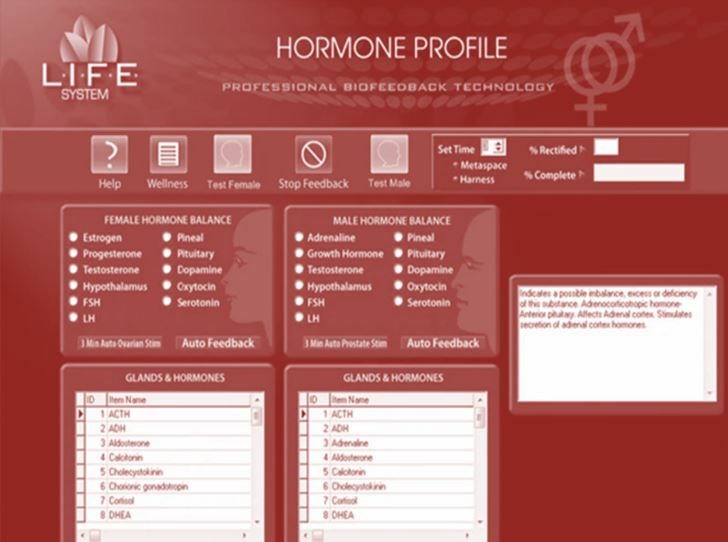 Biofeedback therapy includes a 7000 element health scan, potential specific scans (as below) indicating what is out of balance within you and the frequency feedback to stimulate your body back to health. All one-off sessions include a consultation with Laura. Please note: the first session can last up to 1.5 hours, with follow-up sessions lasting 1 hour. During the first session we will begin to uncover the root causes of fatigue, over thinking; including exhausted adrenals, emotional imbalances, hormonal disruptions, food sensitivities and lots more (see below for available scans). Many people report they feel calmer, anxieties relieved, depression lifted, begin to feel more positive with a sense of lightness, heightened awareness, a reduction in pain, re-energised and a greater connection with themselves. The Body Detox Package is purely using the powerful science of Biofeedback and designed to help you rebalance your body and get you back to a place of wellness. All sessions include any of the scans below and are completely tailored to your physical and emotional needs. Your first session can last up to 1.5 hours and includes your medical history. Follow-up sessions are 1 hour. Please note: Package sessions are valid for 3 months to ensure you get the maximum healing and continuity benefits. How can I expect to feel? You will get peace with your past and have the opportunity to heal unhealthy beliefs impacting your health, wealth and happiness. You will let go of negative emotions such as anger, sadness, fear, guilt, grief etc. Previous clients using the package have reported feeling a sense of lightness, as if something has lifted, happier & calmer, aches and pains have relieved and more energised. In a Momentum Meta you get the 7000 element scan and feedback, however there is no consultation. Laura emails you what's been worked on with the results after the treatment. Most clients text or email to say what they'd like to work on, generally a continuation, or mention any new symptoms that have arisen. Laura's clients find the Meta's to be a very successful part of the packages, as feedback time is longer and more concentrated giving you maximum support throughout your journey to wellness - whatever you are faced with.